The Auto Intel Council (AIC) will be hosting a press conference at this month’s NADA Show 2019 featuring leaders from KAR Auction Services, MBSi Corp. and Maryann Keller & Associates. The Auto Intel Council is a private, membership-based organization owned and managed by Cherokee Media Group, which publishes Auto Remarketing and the Auto Fin Journal, among other auto industry publications and media properties. For more information, contact Auto Intel Council directors Joe Overby (joverby@cherokeemediagroup.com) and Nick Zulovich (nzulovich@cherokeemediagroup.com). 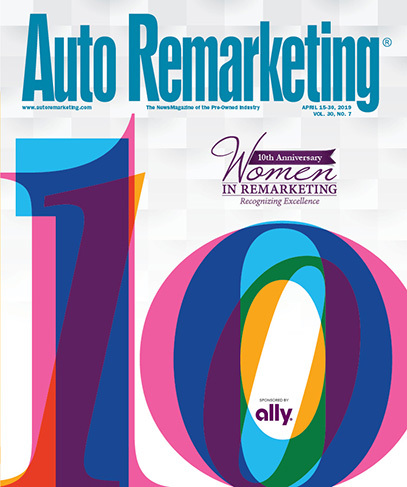 In 2012, Auto Remarketing launched its “Best CPO Dealers in the USA” series, an annual program that includes brand-by-brand rankings of the dealerships with the most certified pre-owned sales from the preceding year. Trophy Nissan is Auto Remarketing’s 2018 CPO Dealer of the Year, an award sponsored by ADESA. Used Car Week is being held Nov. 12-16 at the Westin Kierland Resort & Spa in Scottsdale, Ariz. Early bird registration rates for the conference end after Tuesday. He counts one of pluses as the fact that there’s solid supply. The National Auto Auction Association, National Independent Automobile Dealers Association and National Automotive Finance Association are also industry partners of Used Car Week, which is being held Nov. 12-16 at the Westin Kierland Resort & Spa in Scottsdale, Ariz.
“One of the strengths of Used Car Week is the foundation of key industry partnerships, from the NAAA, NIADA, National Auto Finance Association and of course, IARA,” said Used Car Week chairman and Cherokee Media Group president Bill Zadeits. In its release posted to the website of Vehicle Remarketing, IARA said that the 2017 Summer Roundtable had record attendance and this year’s event came close to those figures. The NAAA Convention is held in partnership with the National Remarketing Conference as part of Used Car Week, which takes place Nov. 12-16 at the Westin Kierland in Scottsdale, Ariz.
To register for the NRC/NAAA Convention and Used Car Week, visit https://www.usedcarweek.biz/register/. The Auto Fin Journal will debut at the Automotive Intelligence Summit www.autointelsummit.com this July. CMG is currently accepting expert contributor applications for content areas of auto fintech, regtech, insurtech, and others. Interested parties should contact Nick Zulovich, nzulovich@cherokeemediagroup.com.